Make sure patients don’t overfill trays and ask them to wipe away any excess. A little goes a long way-dispense conservatively. Ask patients to apply Vaseline to their lips to protect them. Use in conjunction with desensitizing toothpaste. Wash thoroughly to remove the gel off teeth. 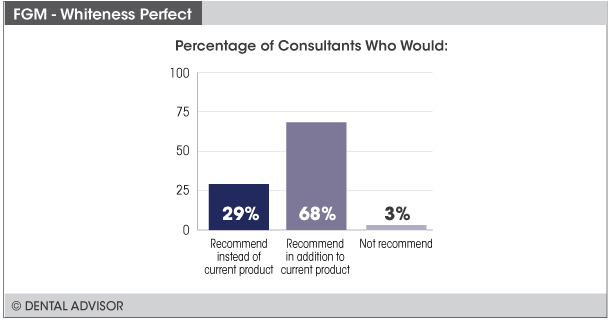 Whiteness Perfect was evaluated by 31 consultants and used for patients 242 times. 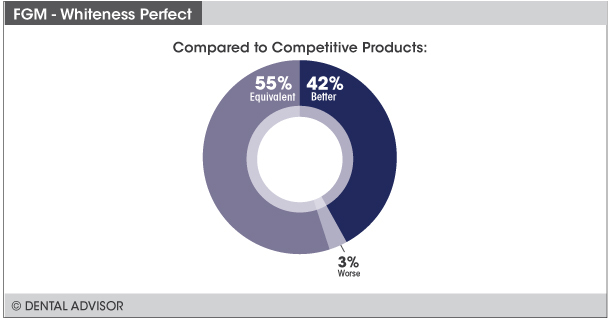 Whiteness Perfect is a dentist-supervised, home-use bleaching agent for vital tooth whitening. It is available as a 10%, 16% and 22% carbamide peroxide whitening gel and contains potassium nitrate and sodium fluoride for desensitization. 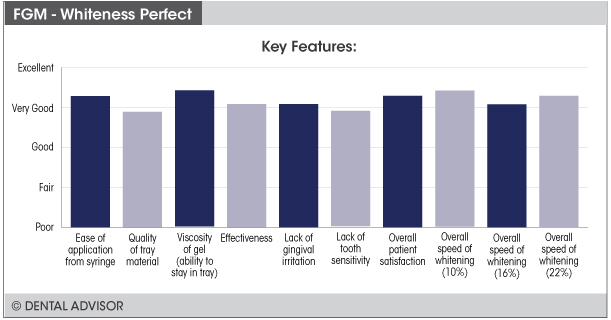 The gel is formulated to offer excellent viscosity to keep the gel in the whitening trays during use, and the pH is close to neutral to avoid demineralization of enamel and dentin. Whiteness Perfect 10% and 16% are available in kits containing 5 syringes of gel (3 g each), 5 applicator tips, 2 soft-tray sheets (1 mm thick), and 1 case for storing trays. Each syringe contains sufficient product for up to 9 applications. Mini-kits are also available in these concentrations, each containing 3 syringes (3 g each) and 3 applicator tips. 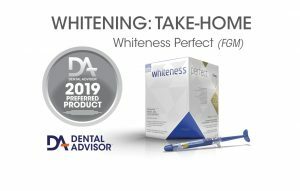 Whiteness Perfect 22% is available in kits containing 4 syringes of gel (3 g each), 4 applicator tips, 2 soft-tray sheets (1 mm thick), and 1 case for storing trays. Bulk packs of individually wrapped 3 g syringes are also available.